Over the past four years, Robert Indiana's LOVE sculpture has undergone a major overhaul to secure its structural integrity. With the structural repairs now successfully completed, the IMA is taking the final steps to restore its surface appearance. Technicians recently used a fine air abrasive system to blast the sculpture's surface in order to remove the original textured, dark purple and rust corrosion, which had been marred as a result of the structural repairs. Over the next few years, the clean, freshly exposed Cor-ten steel will re-weather outside and the smooth steel will transform from silver to a variegated purplish brown patina with iridescent overtones. The first stage of this process may surprise viewers because the sculpture will turn birth orange due to rusting which results from the steel being exposed to repeated wet and dry cycles outdoors. The pace of the change in patina will depend on weather conditions, but eventually the object will turn brown and then continue darkening to its popular, recognizable appearance. 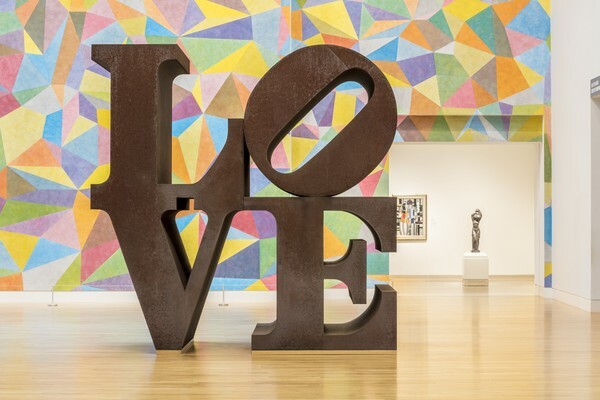 (Robert Indiana, New York, New York); Purchased by the Indianapolis Museum of Art, Indinianapolis, Indiana, in 1975. 144 x 144 x 72 in. Gift of the Friends of the Indianapolis Museum of Art in memory of Henry F. DeBoest. Restoration was made possible by Patricia J. and James E. LaCrosse. This image is not available online larger than a thumbnail to protect the copyright of its creator(s), whose work is represented by the Artists Rights Society (ARS). For more information and to request a larger image file, please review our Image Resources.